Amersham is known as ‘The gateway to the Chilterns’ and is a very commutable location. Only 45 minutes from London but with the added appeal of being surrounded by chocolate box villages and beautiful countryside. It’s no surprise that it is one of the top places in the South East to buy a home and particularly popular with families looking to move out of the Capital. 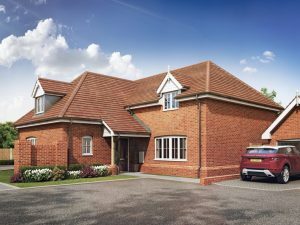 If you are looking for a house to call a home, we have a unique opportunity at Pheasant Close, Amersham. This is a new development of three and four-bedroom family homes in affluent Amersham-on-the-Hill, set in a private select close alongside its Grade II listed neighbour. Each home in this close has been designed for modern living and finished to the high specifications that buyers expect from Troy Homes. With generous layouts and secluded gardens, we expect the upcoming home details to encourage house hunters to snap these properties up quickly. If you are looking for a family home in Amersham, register here to get more news on the properties as they become available. Like many towns in the UK there is the old town, Old Amersham, which is situated in the valley and the new town, Amersham-on-the-Hill. Amersham-on-the-Hill station is known for the growth of “Metro land” in the 1930’s and just like when the railway line first came to the area, Amersham-on-the-Hill is popular with those who need easy access to transport links. Pheasant Close is ideally positioned three minutes drive from the station. Commuters to London arrive at London Marylebone (39 minutes via Chiltern Railways) or to Baker Street via the Metropolitan Line in just 35 minutes. Residents don’t only commute to London from Amersham and for those travelling further afield, the Close also boasts access to the M25 (J18) and M40 (J2) which provides easy connections with the M1 and M4 for Heathrow Airport. While Amersham is an ideal location for city commuters, it has a lot to offer closer to home too. Pheasant Close is just half a mile away from the bustling heart of Amersham-on-the-Hill, perfect for an easy weekend cycle. There is a range of independent shops as well as M&S and Waitrose food halls, the town is also home to some fantastic coffee shops and restaurants to give day to day living a real community feel. Old Amersham offers more picturesque delights, a weekly market with local produce, an artisanal fare and plenty of cafes, restaurants and bars. Top of most parents’ ‘must have’ lists when choosing somewhere to live is the schools. Within a few minutes of Pheasant Close there is a great choice of nurseries and Primary schools, while Dr Challoners Grammar School and Dr Challoners High School have excellent reputations for older children. Older children need not fly the nest too far, with Buckinghamshire New University down the road in High Wycombe. A huge factor to consider for homebuyers looking to move out of busy cities is the appeal of green space, something that Amersham has plenty of. As well as the surrounding Chiltern countryside; an Area of Outstanding Natural Beauty, there are plenty of playing fields supporting local sports clubs, playgrounds, golf courses and many other leisure facilities. It is easy to become part of the community in Amersham, as with a multitude of clubs and societies to suit all interests and tastes, as well as thriving local churches that offer newcomers a very warm welcome. Desirable properties such as those in Amersham, are not on the market for long. Details on Pheasant Close will soon be available, however we expect these properties to sell fast. If a four-bedroom luxury home in Amersham-on-the-Hill is at the top of your wish list, we strongly recommend registering your interest today.